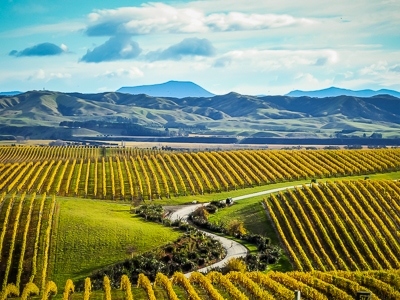 Like a gourmet platter, this tour offers a wonderful taste of some of the best of New Zealand. 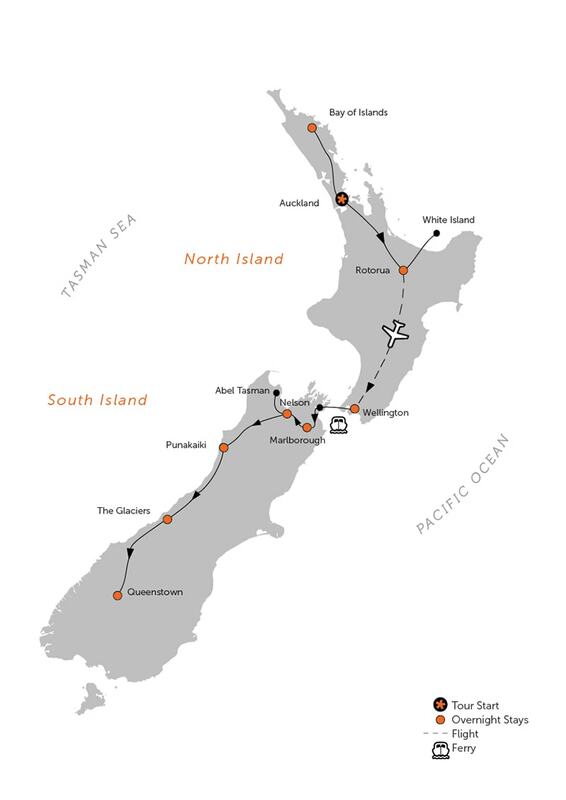 Packed with scenic and activity highlights that take you from the top of the North Island to the bottom of the South, this trip accentuates the diversity of the two islands. Wildlife encounters, volcanoes, beaches, wilderness walks, vineyards, cultural connections, and more make for an unforgettable two-weeks. 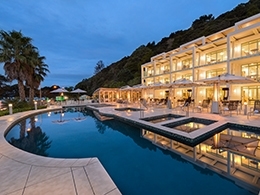 Be greeted by your Black Sheep guide in Auckland and head to the Bay of Islands, a popular yet peaceful retreat. Take a rejuvenating walk or rest from your overseas journey before our welcome dinner overlooking the beauty of the Bay. Spend the day sailing amongst the picturesque islands of the bay. Set the sails or just sit back and enjoy a bit of penguin-spotting before anchoring at a secluded island bay for lunch, a walk and a swim. Giant, ancient kauri trees once dominated the land here, but early milling has left only a precious handful of protected stands. Spend the morning walking amongst these lords of the forest. This afternoon, a guided tour of the historic Waitangi Treaty Grounds and a cultural performance provide deeper insight into New Zealand’s Maori and colonial past. Bid the Bay farewell and return to Auckland via New Zealand’s largest gannet colony. Perched on cliffs high above a wild surf beach, the colony provides a close-up view of its residents as they court, breed, and nest. 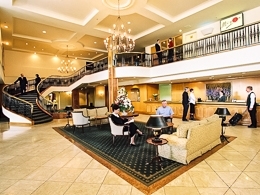 Your Auckland hotel is in the heart of downtown. Dinner is on your own so you’re free to explore this vibrant waterfront city. 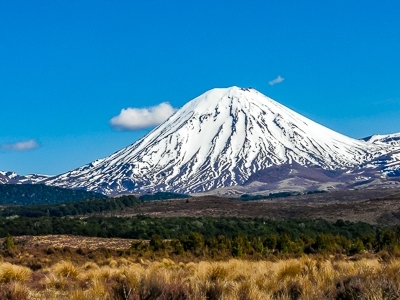 Travel south to Rotorua, a centre for Maori culture and hotbed of geothermal activity. Test the water’s therapeutic properties with a soak at a modern lakeside spa before settling into your boutique hotel. 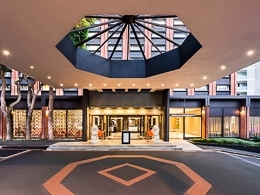 Relaxed and rejuvenated, enjoy dinner in the city’s diverse dining district. Enjoy a day of volcanic and cultural exploration. Take a helicopter flight to White Island, an active volcano 30 miles offshore. 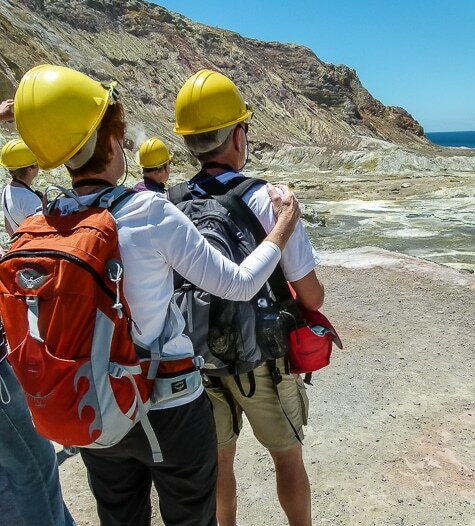 Hike with professional geothermal guides amongst the volcano’s hot streams, steaming lakes, and sulphur vents. 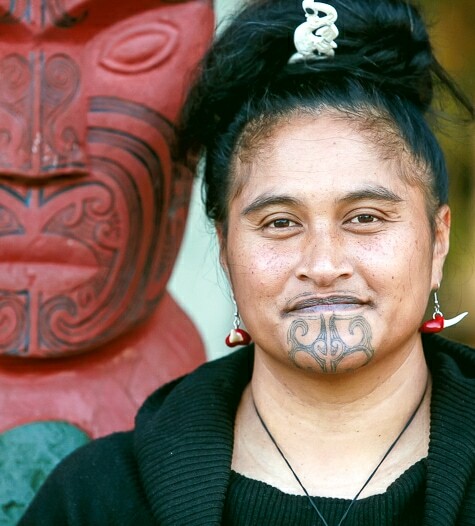 Visit the Maori Arts & Crafts Institute this afternoon then enjoy a free evening. 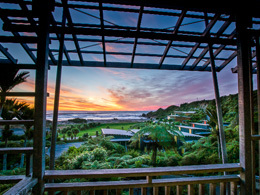 Fly to Wellington and enjoy a day exploring New Zealand's picturesque capital city on your own. 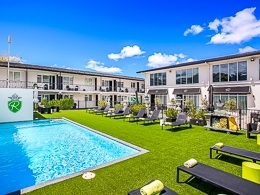 Visit the exhibits at Te Papa, the country's national museum; tour Parliament; ride the cable car to the botanical gardens; or stroll through galleries and along the bustling waterfront, all an easy walk from your hotel. Located in the heart of Marlborough wine country and set amongst the vines, your suite’s private patio offers the perfect setting for a world-renowned sauvignon blanc at day’s end. Ferry from the North Island to the South via the crenulated coastline of the Marlborough Sounds. 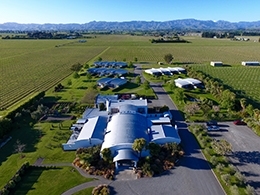 On land, travel to the renowned Marlborough wine region for a vineyard lunch and visit Omaka Aviation Heritage Centre to view war exhibitions brought to life by internationally acclaimed Weta Workshop. Settle into your lodging amongst the vines before a special winery dinner this evening. 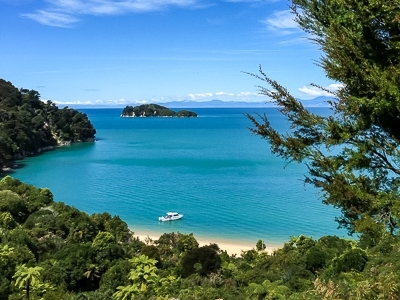 The nearby Abel Tasman, with its temperate forest, aquamarine waters, and golden beaches, is arguably one of the most beautiful parks in the country. 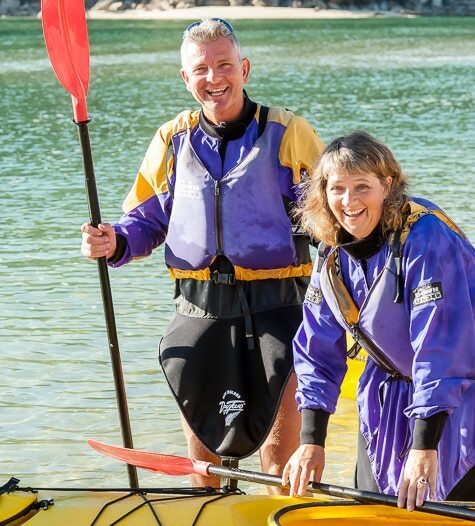 Travel there this morning for a very special sea kayaking and hiking experience along its coast. Alternatively, choose a guided hike-only or scenic cruise option, returning to Nelson to dine and relax after your adventure. Pass through the beautiful Buller Gorge on route to the wild and woolly West Coast. This part of the South Island is honeycombed with intricate cave systems. 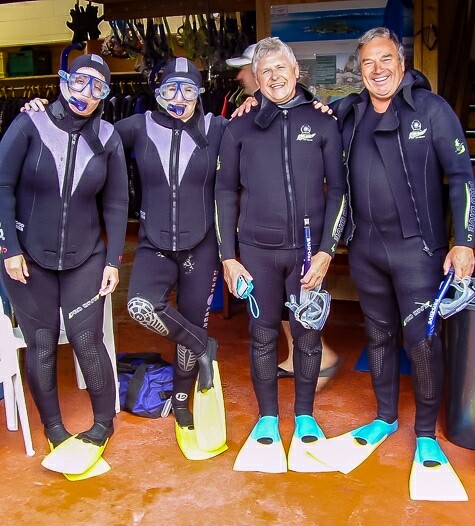 Stop and explore one of these systems on a scenic caving tour before continuing to your seaside eco lodge at the base of the Paparoa National Park. 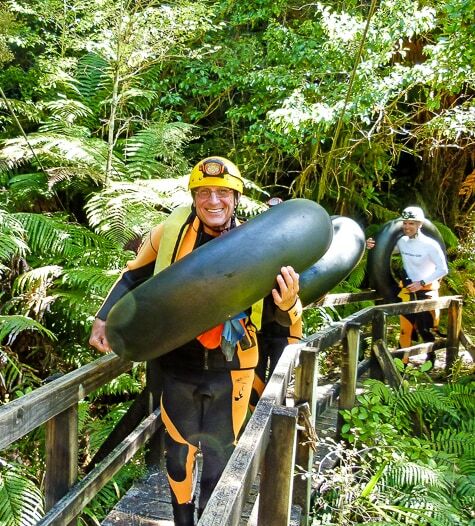 For the truly intrepid, a cave rafting alternative is available. 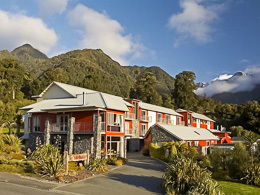 Head south to the village of Franz Josef, gateway to spectacular Glacier Country. 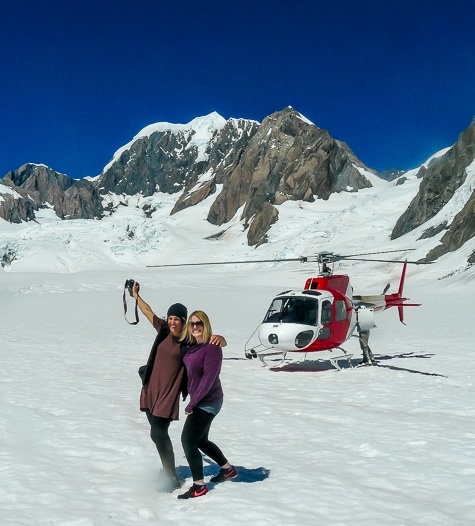 Take a scenic helicopter flight over the glacier’s blue-ice crevasses to land on its neve. 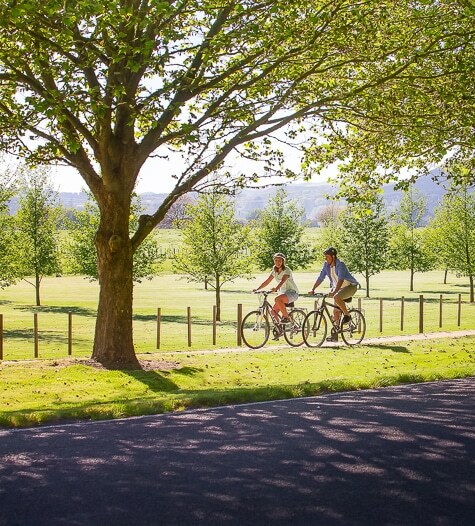 Continue your drive to the sister village of Fox and explore the region on foot. 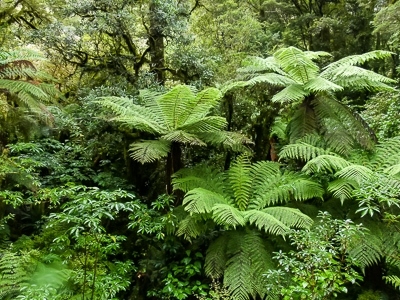 Take a self-guided hike to the Fox Glacier face and a walk through a stand of old-growth rainforest, narrowly missed by the glacier long ago. Take a morning walk around Lake Matheson, created by retreating glaciers. From there, it's a stunning drive through the Mt Aspiring National Park, with stops at hidden trails and secluded waterfalls. Pause in the lakeside town of Wanaka before crossing the spectacular Crown Range and descending to your lakeside lodging in Queenstown. 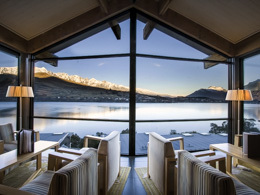 Queenstown is replete with options you never even knew you wanted on your bucket list. After breakfast, the day is yours to pick and choose whatever optional activities you desire, from the sublime to the ridiculous (we have recommendations for both). 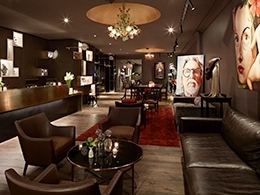 Your farewell dinner this evening is a chance to share tales of the day’s adventures and celebrate your time together. Depending on your flight schedule, take a lakeside stroll, fulfill your gift list, or consider one last adventure before you’re dropped at the airport for your return flight home. 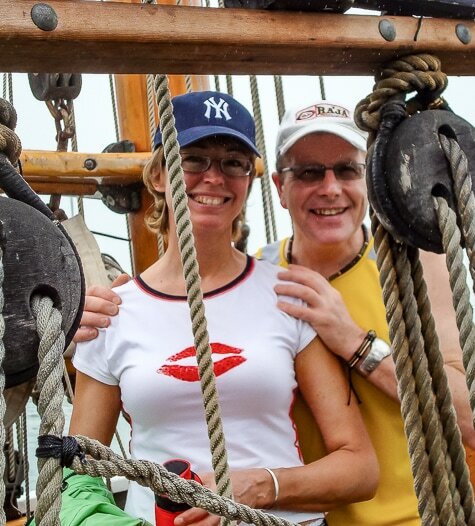 MY HUSBAND AND I JUST RETURNED FROM THE BEST VACATION EVER!